Most wood pallets can be reused and repaired multiple times, aside from a small proportion designed for single use. 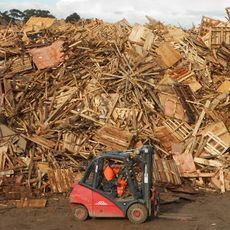 Reusing the pallets saves trees, energy and diverts useable materials from landfill. Plus they can be upcycled into very impressive products. From a student's desk, drawer and chair, to coffee tables, lounges, armchairs and bedside tables, wood pallets have been beautified and ‘trendified' with some very inspiring results. *Calculation uses NSW data for timber pallets/packaging (Commercial & Industrial and Construction & Demolition recycling only) contained in Table 4 (p.14) Department of Environment, Climate Change and Water NSW (2010) Environmental Benefits of Recycling, DECCW, Sydney South. Cumulative energy demand savings expressed as average household annual electricity requirements (6,000 kWh).